We now have sufficient strength to be able to remind you to vote for your favourite BunnyTune. Okay, this week I cast my vote for "These Feet Were Made For Hoppin'" because I know that you will be hopping all around when you have finished those treats. Carrots for tea please... the orange and the green is the best I've seen. We're not sure what to vote for now as "Handbags and Tin-treats" was #1 last week ! 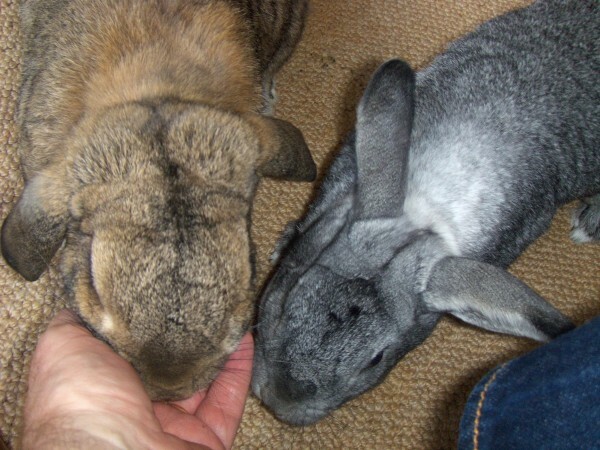 We're going to stick with the theme of old bunny tunes, and both vote for "All The Little Bunnies" ( because Bella & Greta are in the video along with Maddie & Una etc ). And we'd like to dedicate it to Leony ( our newest friend ) and all the bunnies that are leaving the Bunny Digs to go to their new burrows. No doubts fur us this week - it has to be 2 votes fur 'Hay, Glorious Hay' with a whole 2 acres of it, 6' tall in places to be cut by 2-foot paw just fur us. "hay,hay glorious" for us ,Finley & Leony .